2017 has been a bumper year for global IPO activity. According to a new report from EY, by deal number, 2017 was the most active year for IPOs globally since 2007. The report, 'Global IPO trends: Q4 2017', notes that to December there were 1624 IPOs with $188.8bn raised – an increase of 49 percent by number of deals and 40 percent by capital raised, compared with 2016. IPO activity in all regions has seen double digit growth, with the Asia-Pacific region dominating. There was an increase of 44 percent in Asia-Pacific in 2017 with 935 IPOs completed. The bulk of the activity in the region was completed in the first half of the year. Q4 was the weakest period with only 240 deals – a 4 percent year-on-year decline. Proceeds in 2017, at $73.2bn, were only 0.2 percent higher than in 2016, indicative of a decline in average deal sizes. Exchanges based in Asia-Pacific took the top three rankings globally by deal number. Greater China exchanges saw 582 new listings in 2017 – a 68 percent increase on 2016. IPOs in the US also saw a notable increase in 2017, with 174 raising $39.5bn, an increase of 84 percent in proceeds and 55 percent by volume compared with 2016. According to EY, the Americas were responsible for 13 percent of global deals and 27 percent of global IPO proceeds in 2017. 2018 is also expected to be a notable year for IPO activity, with many mega-deals said to be on the horizon. Emerging markets contributed strongly to 2017’s IPO activity, and the EY report notes that a number of state-owned enterprise IPOs are expected across the Middle East and North Africa next year, with exchanges in the US, Greater China and the UK also likely to feature heavily. 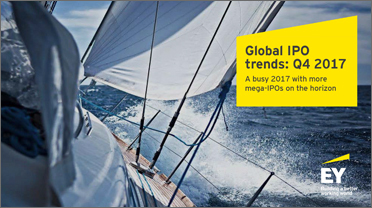 The global IPO market has belied the uncertainty surrounding the global economy, registering the most impressive Q1 in a decade, according to a new report from EY – 'Global IPO Trends: Q1 2017'. EY’s report reveals that it was the most active first quarter by number of IPOs globally since 2007, with 399 IPOs raising $47.5bn. In terms of year-over-year growth, there was a 92 percent increase in number over 2016, and a 146 percent increase in total value. The technology sector was the biggest sectoral winner. The industry contributed $6.5bn despite not having the highest number of IPOs. The tech space saw 45 offerings compared to 66 in the industrial sector, which registered proceeds in excess of $4.1bn. By contrast, the telecommunications space was the least active sector, with only six IPOs raising just $351m. In the US market, 24 IPOs raised $10.8bn, the region’s best performance since Q2 2015, when 72 IPOs raised $14.3bn. The region suffered in comparison to the Asia-Pacific area, which was led by Greater China. In total, Asia-Pacific generated 70 percent of the total number of IPOs, for $16.2bn. However, the US’ performance was still strong. "The first quarter of 2017 was one of the strongest for the US IPO market and established a solid runway for more deals for the remainder of the year”, said Jackie Kelley, EY Americas IPO Markets Leader. “This positive performance should attract more tech and unicorns to the public markets and further open the door for other sectors such as retail, energy, and real estate. With the market currently insulated from the political uncertainty, more companies are expected to enter the filing process." Dr Martin Steinbach, EY Global and EY EMEIA IPO Leader, said: “This is a promising start to global IPO activity this year. In the face of sustained global economic uncertainty, the first quarter of this year has set the stage for accelerated growth in 2017. Economic fundamentals are improving in the major developed economies. Equity index performance and valuations are trending upward, with several major indices reaching all-time highs. Concurrently, volatility is low, underpinning positive IPO sentiment, which is also supported by the successful US listing of a large technology unicorn." Exchange Traded Funds (ETFs) are expected to grow exponentially over the next five years, with global assets under management (AUM) set to top $7 trillion, according to a report released this week by PwC. In ‘ETFs: A roadmap to growth’, PwC predicts that the ETF market will achieve further significant growth through entering new markets, expanding distribution channels and asset classes. The report’s main findings show that: (i) the North American ETF market is expected to grow to $5.9 trillion by 2021 (a 23 percent cumulative annual growth); (ii) the European market is expected to grow 27 percent annually (reaching $1.6 trillion AUM by 2021); and (iii) Asian firms expect ETF AUM to reach $560bn by 2021 (an 18 percent annual growth rate over five years). Furthermore, the top three segments that are driving this growth globally are financial advisoes, online platforms and retail investors (online platforms having overtaken wealth management platforms to take its place within the top three). Also found to be a factor in the growth of ETF markets is the advances seen in technology and data analytics, which have encouraged new product creation and driven an evolution in distribution channels. In addition, says the PwC report, digital technology and Big Data will continue to enable successful firms to improve decision making processes, streamline costs and transform investor relationships. “The global ETF market has a bright future ahead but the next few years will not be without their challenges," said Nigel Brashaw, global ETF leader at PwC. “The ETF market continues to be increasingly crowded, particularly in North America and Europe, where both maturity and momentum continues to dominate. Another key challenge and one cited as a major obstacle to growth by 47 percent of survey respondents is that of increased regulation. The PwC report surveyed executives (more than 70 percent of the participants were ETF managers or sponsors from approximately 60 firms around the world) during 2015 using a combination of structured questionnaires and in-depth interviews. For the global IPO industry, the first quarter of 2016 was disappointing period, recording the weakest activity since the first quarter of 2009, according to EY's Global IPO Trends 2016 report. Although the second quarter of the year saw the IPO space enjoy a marked recovery, at the mid-year point activity remains significantly below the first half of 2015. The second quarter of 2016 saw a 120 percent jump in capital raised, climbing to $29.6bn from 246 deals – up almost 29 percent on the first three months of the year. US capital raised was up 755 percent, Asia-Pacific was up 20 percent, and Europe, the Middle East and Africa saw an uptick of 187 percent. The UK and Greater China were the only major IPO destinations that failed to see an increase in capital raised. The most significant gains were made by Australia and New Zealand, which saw proceeds increase by 820 percent. The report suggests that though things improved significantly in the second quarter, there is more to be done if 2016 is to match IPO activity seen in recent years. Worryingly, the market will remain at the mercy of a febrile global economy which looks set to remain in a period of uncertainty. Given this economic and political volatility, the IPO industry will experience an uncertain second half of the year. Speaking of the report, Jackie Kelley, EY Americas IPO leader, said: "Despite the substantial uplift in global IPO activity in the second quarter, there are still a large number of IPO-ready companies sheltering from continued volatility and waiting for much needed clarity on the global economic and political landscape. In the meantime, activity is slow but improving." If the outlook improves, a number of IPO-ready companies are waiting to enter the market. However, concerns surrounding the UK’s EU referendum result, the impending US presidential election and persistent worries about the direction of interest rates are all likely to impact on IPO activity moving forward. There is, however, an impressive pipeline of technology IPOs developing in the US, which may encourage activity after the November election. The British people have spoken and in a historic vote have chosen to leave the European Union after 43 years. The decision to leave was secured by a vote of 52 percent to 48. A result that until fairly recently was considered unthinkable has been handed down this morning and, as result, global financial markets and stocks were plunged into a drastic and inevitable downward spiral. As a result of the ‘leave’ campaign’s victory, the pound fell 10 percent against the dollar, dropping to levels last seen in 1985; European shares too dropped more than 8 percent. Furthermore, billions of dollars were wiped off the market value of several of Europe’s biggest banks. The UK’s decision to exit the European Union is a lurch into the unknown not only for Britain but for the wider European and global economies. Though there are many throughout Europe who have taken issue with the direction and policies of the 28 nation bloc, no country has ever taken the nuclear option and opted to leave. Though the vote is hugely momentous for the UK, the result will also be significant for the future of the EU itself. Should the UK secure favourable exit terms from the bloc once Article 50 of the Lisbon treaty has been invoked, further disintegration of the bloc could occur. With France in particular becoming increasingly hostile to the EU, there will be interesting spectators on the other side of the English Channel watching the negotiations. With Brexit secured, ‘Frexit’ could be next on the agenda. As such, given the uncertain nature of Europe’s political and economic status, how the remaining 27 members of the union handle the UK’s exit could have huge ramifications for worldwide economic stability. For the UK’s economic development, there are further issues which will be raised over the coming months and years. London’s status as Europe’s preeminent financial centre will be called into question moving forward, as will the potential of a return to recession for both the UK and Europe. The possibility of an emergency Brexit budget has been mooted by the chancellor of the exchequer, George Osborne, though this may seem unlikely given his ‘Remain’ loyalties. While the future of the country is uncertain, one thing we know for sure is that prime minister David Cameron will not be the man to lead the way. By the time of the Conservative party conference in October, the UK will have a new leader as Mr Cameron chose to announce his resignation on Friday morning as the world was still digesting the result of the referendum. The future of the chancellor, a man who many considered a natural successor, may also be tied to that of his prime minister; Mr Osborne may now find himself on the outskirts of the political agenda, with chief Brexiteer Boris Johnson the frontrunner to replace Mr Cameron. No matter who leads the country, the timing of the invocation of Article 50 will be crucial. Its activation will start the two year countdown toward Brexit, during which time the manner of the UK’s exit will have to be decided, as will the nature of the country’s future relationship with the EU. Given the shaky ground on which the global economy sits, the decision of the British people to turn away from Europe will likely be damaging. The country’s access to the EU's trade barrier-free single market will likely disappear or be hugely curtailed. For both Britain and the global economy, all bets are off.